As helpful as it may seem to look at ways to improve a pay per click advertising campaign, it can be equally helpful understanding the reasons that cause PPC campaigns to fail too. This is because by seeing where campaigns fail will help you, the advertiser, learn from other people’s mistakes so that you do not make the same errors that others made. 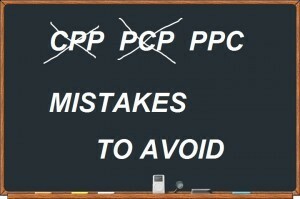 For this reason, here are three reasons why PPC campaigns fail with ways you can make sure you do the same mistakes. At the end of the day, the biggest factor that will affect how successful your campaign is will be your budget. The problem with many advertisers is that they find their budget is quite small – small enough to make them concerned how to use it. This usually results in the advertiser lowering their CPC to get more clicks per dollar. However, by doing this, the whole targeting of the campaign goes AWOL since changing the CPC of your keywords will significantly change where your advert is located on search results, who sees it, how they see it and more. Therefore, the answer is not to lower your CPC if your budget is small. Stick to whatever CPC works best and if you run out of budget, you run out of budget. The main statistic that should concern you is the cost per conversion and with a higher CPC, you are more likely to gain a lower cost per conversion. Negatives keywords are basically keywords which advertisers do not want their advert to bid and show up for. Not only can they save you money by stopping your advert from showing for similar keywords that will not convert for you, they will also make the traffic that sees your advert more specific and contextual (which usually results in a healthier CTR and conversion rate too). Therefore, it is a must to use negative keywords with any PPC campaign: they can honestly make or break a campaign. Make sure you have a wide range of negative keywords at the start of your campaign and add negative keywords as it runs based on what ad impressions your adverts get. Now, if you have read some of my articles on landing pages, you will know that there is one exception: the homepage. The only times you do not have to make a dedicated landing page is when use your homepage (and this should only happen when you have a similar styled website/website layout to Amazon or specifically have to use your homepage). My point is that any other type of landing page such as a click through page, lead capture, infomercial etc. always needs to be created as a standalone landing page. If you do not do this, you should not be surprised to see that your campaign does not achieve the results you were expecting: just think about how important the landing page actually is! SEO vs PPC – Which One Should You Use?